(and Chromebox for Meetings), and all participants are notified that the meeting is being recorded. Recordings are saved to a “Meet Recordings” folder in the Drive of the meeting owner and the recording is automatically attached to the Calendar event and shared with all invited guests in the same domain. 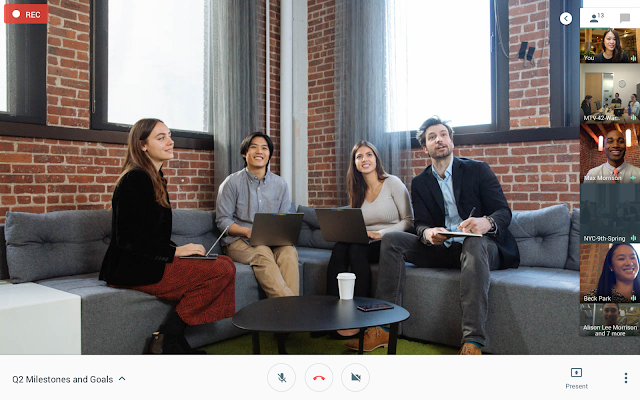 G Suite Enterprise edition admins can control whose meetings can be recorded at the organizational unit (OU) level. Within the Admin console, navigate to Apps > G Suite > Settings for Google Hangouts and select “Meet Settings.” Please note, this setting is on by default for all OUs. The setting is disabled for OUs that don’t have Drive enabled. Whether for trainings, important announcements, or syncing with your team, meetings have many purposes. Sometimes not every teammate can attend, or there is a need to share or reference notes from meetings after they have ended. To simplify this process, Hangouts Meet video meetings for G Suite Enterprise edition can now be recorded and saved to the cloud, making them easy to share, view, and even play in sped-up mode. Any participant in the same domain as the organizer can start and stop a recording from web or Hangouts Meet hardware (and Chromebox for Meetings), and all participants are notified that the meeting is being recorded.